Coincidence? Did Fr. Kramer's Criticism of Francis Produce Fatima Center Split? It Seems So. We have had a bit of interesting information provided to us by one of our readers. On August 28th, the same day that we were informed that the Canadian Branch of the Fatima Center had cut off the American Branch of Fr. Gruner's work, our reader sent a video to someone at the Fatima Center (Fort Erie, Ontario) of Fr. Paul Kramer describing the meeting between Russia's Vladimir Putin and Francis I in Rome in 2013. In this meeting, according to Fr. Kramer's diplomatic and Vatican sources, Putin actually asked Francis about the Consecration of Russia to be done. Francis responded by saying, "We will not speak of Fatima!" Fr. Kramer then mentions a statement of a high level Vatican official who says to a Russian intelligent agent that, "We will crush Fatima!" 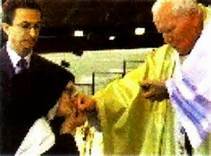 I have posted a video of "Sister Lucy" receiving communion from John Paul II at Fatima. The worshipful reverence which she shows to the man that putatively just handed "Sister Lucy" Our Eucharistic Lord is odd to the extreme. Can this possibly be the woman who in 1916 had an angel appear to her and her two friends Jacinta and Francisco and had the angel prostrate himself before the Blessed Sacrament which appeared for their worship? Is the hand that gives you communion more venerable then the Eucharistic Lord that you believe to be the God Incarnate Himself? Would you then demand to stay on the altar when you know that it is not the place of a cloistered nun or even a woman at all, to be in the sanctuary? 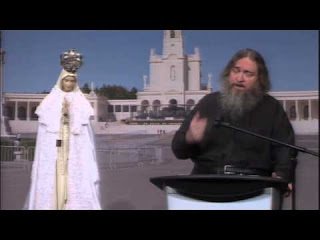 Fatima Center Splits: What are the "controversies that would distract"? Fatima Center Splits After Fr. Paul Kramer DISINVITED to California Conference....Details to follow soon. 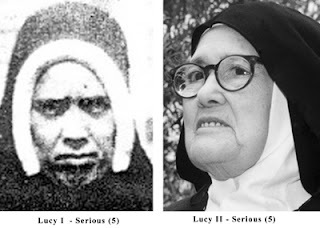 The Elephant in the Room --- What happened to Sister Lucy of Fatima? And Why do So Few Seem to Care? 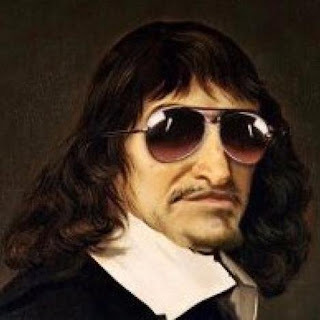 Descartes' Dream: Where Modernism Began --- As if It Mattered! The Infiltration of Modernism In The Church The commentary in the brackets is my own; I have also put in bold the sections of the conference that I want to emphasize. 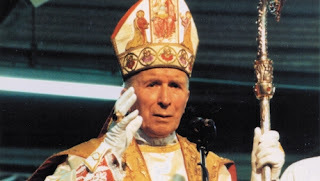 It is important for all sides to recognize what Archbishop Marcel Lefebvre actually thought and said. Here we have a conference given in 1982, when the struggle over the existence of Tradition was full on.